The Medical Marijuana ID Program, provided by the Marin County Department of Health and Human Services, Office of Vital Statistics, offers seriously ill Marin County residents an efficient and confidential method to verify to law enforcement representatives that they qualify for the use of medical marijuana. This program is consistent with the intent of Proposition 215 (California Health and Safety Code-Section11362.5). This service is available to both patients and their primary caregiver. The current fee for the State of California Medical Marijuana Photo ID Card is $100 (Medi-Cal patients receive a 50% reduction in this fee. The fee for CMSP patients is $0). The following information outlines the policies and procedures that will be used to issue cards. Patients wishing to be certified for the Medical Marijuana ID Card Program may call the Marin County Office of Vital Statistics at 415-473-3288 to request an application packet. 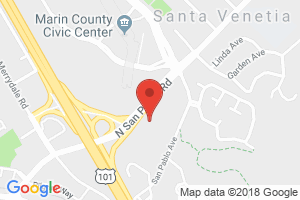 Application packets can be obtained in person at 10 N. San Pedro Road (Reception), San Rafael, CA (office hours are Monday-Friday 9:00am-4:00pm). Additional information about the packet or any other questions may be answered using the California Department of Health Services website. Application packets include: information about SB 420 and the County ID Card Program, Frequently Asked Questions and, the Medical Marijuana Photo ID Card Application. The application is complete, including the physician's section. The physician named by the applicant currently holds a license by the State of California. The physician has orally confirmed the recommendation of the use of medical marijuana for the patient. Patients' proof of identity in the form of a photo ID: California State driver's license or ID card; United States Passport; or Veteran's Administration ID Card. Patients' proof of residency in Marin County in the form of a California State driver's license; a County ID card with a local address; or a recent utility bill, recent mortgage or rental payment that includes the applicants address. If applicable, the patients' proof of Medi-Cal status (there is a reduced fee for the Medical Marijuana Card for Medi-Cal patients). After verifying the information above (by appointment only), the applicant will be approved for the Medical Marijuana ID Card Program. A fee will be collected and the applicant's photo will be taken (State Card Fee = $100.00, State Card Medi-Cal = $50, CMSP = $0). The photo, Medi-Cal status (if applicable), and Medical Marijuana ID card expiration date will be sent to the State of California via a secure web site. The State of California does not receive any other identifying information, such as name or address, from the Office of Vital Statistics. The State of California will issue a photo ID card with the patient's photo, date of expiration, ID number, card verification internet address, and local Office of Vital Statistics contact information. ID cards can be picked up at the Marin County Office of Vital Statistics upon receipt from the State of California. Applicants must contact the Marin County Office of Vital Statistics to renew their certification and repay the fee (415-473-3288). No notice of expiration will be issued. Lost or stolen ID Cards must be reported immediately so that they can be invalidated and a new card issued. Applicants should keep a record of their ID number in a safe place for reference. To replace a lost, stolen or damaged card, the applicant must reapply for a new card and pay the full fee of $100 (Medi-Cal = $50). For the purposes of the Medical Marijuana ID Card Program, a primary care giver is an individual "who has consistently assumed responsibility for the housing, health, or safety of a patient who is applying for certification with the program. In order to be certified as a Primary Caregiver for the Medical Marijuana ID Card Program, a patient who is approved for the program must identify the Primary Caregiver as such in section 4 of their application. Applications packets are available upon request by calling the Marin County Office of Vital Statistics at 473-3288. Applicant/caregiver may pick up packets from the Marin County Office of Vital Statistics, 10 N. San Pedro Road (Reception), San Rafael, CA., Monday-Friday 9:00am-4:00pm. An application packet may also be downloaded and printed via the links above. Application packets include: information about SB 420 and the County ID Card Program, Frequently Asked Questions and, the Medical Marijuana Photo ID Card Application. The application is complete, including physician's and primary caregiver's sections. The Primary Caregiver has been named by the patient and has signed and completed section 4 of the Medical Marijuana Photo ID Card Application form. Proof of identity in the form of a photo ID: California State driver's license or ID card; United States Passport; or Veteran's Administration ID Card. Proof of residency in Marin in the form of; a California State driver's license; a County ID card with a local address; or a recent utility bill, recent mortgage or rental payment that documents the local address. After verifying the information above, the applicant will be approved for the Medical Marijuana ID Card Program. A fee will be collected and the caregiver applicant's photo will be taken. The photo, caregiver status, Medi-Cal status of the patient, and Medical Marijuana ID expiration date will be sent to the State of California via a secure web site. The State of California does not receive any other identifying information, such as name or address, from the Marin County Office of Vital Statistics. The State of California will issue a photo ID card with the caregiver's photo, date of expiration, ID number, card verification internet address, and local Office of Vital Statistics contact information. To give strong protection to physician and patient confidentiality, all forms submitted will be returned to the patient. The fee for Medical Marijuana ID cards is $100. The Medi-Cal fee is $50. Cards will be valid for one year from date of application. Applicants must contact the Marin County Office of Vital Statistics to renew their certification. No notice of expiration will be issued.